Robert W. Hastings, Alabama Sierra Club contact for the joint Alabama, Georgia, and Florida Sierra Club statement against the pipeline, and author of a FERC ecomment against the pipeline, was elected Chairman of the Alabama Chapter 9 March 2014. I attended both the Alexander City and Butler hearings, and was disappointed in both. There was apparently a lot of apathy and/or intimidation among people affected. There were about 50-75 people at Alex City but only about 7 people spoke. I read the Alabama-Georgia-Florida Sierra Club statement, and got a few compliments after the meeting. At Butler, there were only 7 people present (plus about 15 “company” employees who answered questions, but there were not many questions). Because of the small group, we sat in a circle with the FERC reps and listened to their statements and asked a few questions. No landowners made statements and I agreed to submit mine online. It was a long drive for not much information. I was also told that about 25 people attended the Seale hearing but no one submitted comments (according to Bill Braun, a “first zero” for FERC hearings). 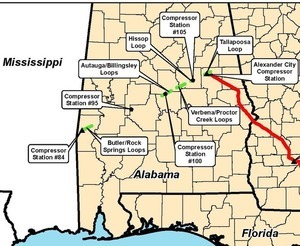 Bill Braun was the FERC representative (a contract environmental consultant) from Minnesota who described the projects at all three hearings in Alabama, along with Kara Harris.